There are several aspects of planning a funeral that many people don’t think about until the time comes. One of those oft-forgotten parts is planning the funeral lunch. It’s likely that after a funeral, many of the family and friends who are celebrating the life of a loved one will want to gather to mingle, mourn, and honor together. It is during this time that having a bevy of comforting, yet nutritious, food is imperative. But if the onus of planning the funeral lunch falls on you, this can be easier said than done. If that seems to be the case, then don’t hesitate to contact Etai’s Catering. We are happy to provide the very best in fresh, local funeral catering in Denver since 1994. Our options will be tasteful — and tasty — while also helping to provide comfort and nourishment for you, your friends, and your family. 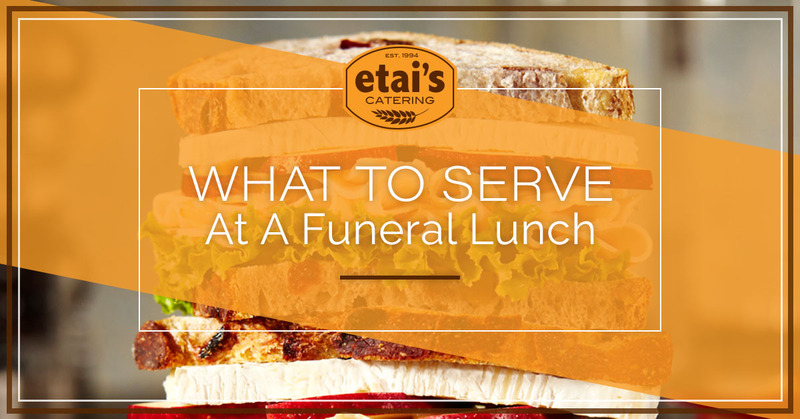 So, what should you serve at a funeral lunch? Keep reading to get a few ideas and place an order with Etai’s Catering in Denver today. Chances are, the people in attendance aren’t going to be in the mood for an extravagant spread. That being said, it is still important to provide options for everyone to eat. The trick is to find the perfect balance between simple and comforting — all without sacrificing quality. You don’t want to have foods that are going to make a huge mess (pasta, BBQ, etc.) or foods that are going to require a lot of effort or special requests (seafood, grilled meats, etc.). Instead, opt for a catered spread that is fresh, simple, and elegant all at the same time. Take a look at our Denver funeral catering options today to get a better idea of what we offer at Etai’s Catering. Here are a few of the options that we are able to provide for funeral lunches. There aren’t many options that are much more convenient or tasteful than box lunches. This option is great to provide funeral reception guests with a quick bite that covers all of the bases — our box lunches include a choice of sandwich, side, chips, drink, and even dessert. When you’re looking for something simple and fresh, particularly for those guests who are filtering in and out, box lunches are a great and viable option. Another solid option for your funeral lunch or reception is to simply offer a smorgasbord of sorts. That way, your guests can pick and choose what they want to snack on — whether it’s a quick bite of fruit or a plate full of meat and cheese. When planning a funeral lunch, one thing you certainly don’t want to forget is something that provides comfort. Dessert might be the most important part of your funeral lunch. Need help with your funeral lunch? Contact Etai’s today and count on our fresh Denver catering services today.